HoverLloyd SRN4 Hovercraft and the VA-3 of British United Airways. Homepage. 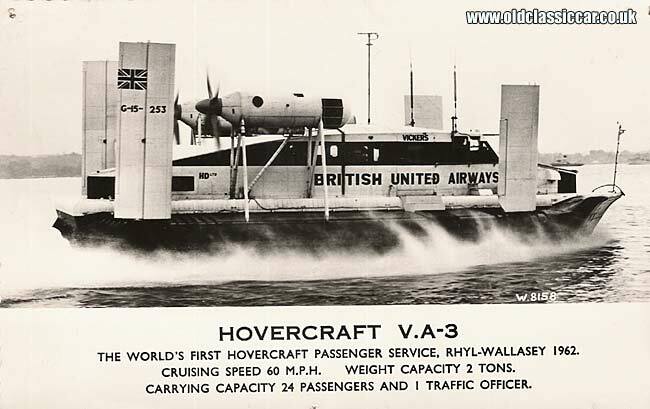 This page: A couple of pictures showing British hovercrafts, operated by HoverLloyd and BUA. Ok they aren't cars, but as I like most transport-related photos, I made a little room for Hovercrafts on the site. First up is another old colour photograph sent in by Alan, showing a moored (parked?) SRN4 Hovercraft at Pegwell Bay. Back to Car Photographs Page 3. I'm the first to admit that I know nothing about Hovercrafts, although I've always thought them to mighty impressive machines. Can anyone tell me the name of the Hovercraft shown above? Sadly I don't think these monsters are still used to cross the English channel, more's the pity. 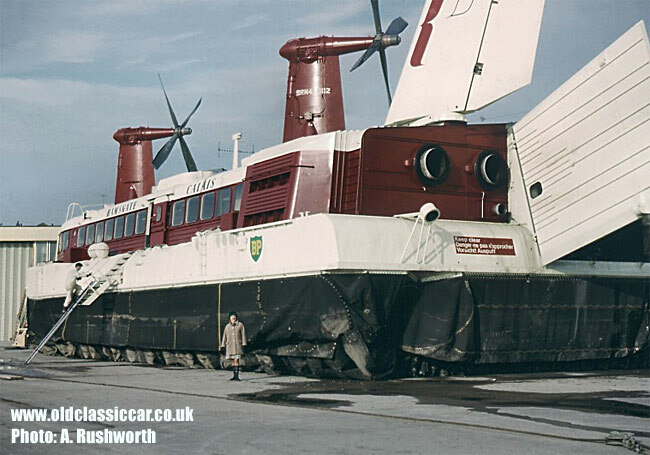 The SRN 4 shown here would have been used on the Ramsgate to Calais service, and was built by the British Hovercraft Corporation. Use of these Hovercrafts came to an end in 2000, and yet another characterful British machine disappeared from use. In recent years so many innovative modes of transport have vanished - Concorde being perhaps the most publicised. G-BOAC is parked at Manchester Airport, not too far from here, but its just not the same seeing it lying dormant out in all weathers, and I'm sure locals on the south coast miss the roar of the Hovercraft too! I've had this photo-postcard for a few years but never really had anywhere suitable to show it, til now, so here it is. It shows the world's first hovercraft passenger service, which operated between Rhyl, in North Wales, over to Wallasey on the Wirral. The photograph was taken in 1962, and shows the Vickers VA-3 registered G-15-253. The cruising speed was 60mph, and could carry 24 passengers. If Hovercrafts are of interest, there are a few websites around that are worth a look at. James' Hovercraft site is very interesting (link here), as is this Dover site. Several old hovercrafts have made it into preservation, and the Hovercraft Museum site details those being looked after by a dedicated Trust.